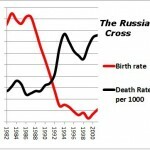 Demography I – The Russian Cross Reversed? The demographic situation in Russia is usually painted in apocalyptic terms. The Russian Cross – the post-Soviet transition into a world of death without new life – will supposedly preclude it from attaining First World living standards and wreck any Great Power, let alone superpower, pretensions. Is Russia Too Sick to Matter and the Sick Man of Europe, as alleged by Nicholas Eberstadt in two reports in 1999 and 2004, respectively? Are we seeing the Death of a Nation? To answer these questions, we’ll look at the statistics and trends, and extrapolate into the future under three different scenarios – 1. Stagnation, 2. Improvement and 3. Transformation. In the end we conclude that while the demographic, or rather the mortality, problem is indeed serious, it need not entail pessimism if appropriate measures are taken. Nor will it have anything but a negligible effect on the economy. First, let us look at the historical trends. 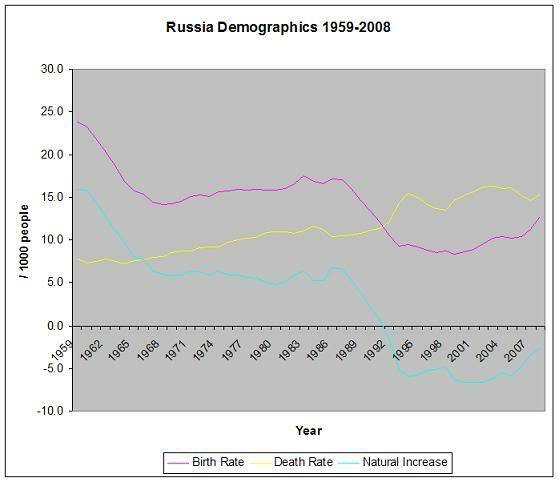 Below, I have collated the birth and death rate for Russia from 1959-2008 using data from The Human Mortality Database, Soviet Economic Statistical Series and Rosstat. Subtracting the death rate from the birth rate gives the rate of natural increase. The rate of natural increase would have closely correlated with overall population growth in Soviet times, since migration either way was small then. The same cannot be said of the 1990’s, though, when there was a large-scale influx of ethnic Russians from the newly independent Near Abroad. While throughout much of the period the rate of natural increase was below -0.5% annually, the population decreased at a much lower rate – indeed, serious decline manifested itself only from around 2000, by which time the flow of migrants had slowed down). As you can see, the birth rate experienced two transitions – in the early 1960’s and early 1990’s. The fertility rate fell from 2.6 children per woman in 1960 to replacement level (2.1) by the late 1960’s, where it hovered until 1990. In the 1990’s, it dropped precipitously, to 1.34 in 1995 and reaching a trough of 1.17 in 1999. Since then, there has been a slow recovery up to 1.30 in 2006 and rapid spurt recently. In fact, as contributor Oleg pointed out, this is getting noticed in the Western media – Russia Has First Post-Soviet Baby Boom. A booming economy, state sponsored pro-natality propaganda campaign and a 2007 law that ‘expanded maternity leave benefits and payments, and granted mothers educational and other vouchers worth $10,650 for a second child and any thereafter’, contributed to the fertility rate rising to 1.39 in 2007 and more than 1.50 this year. This is more than the average for the European Union and approaching the United Kingdom. Is this a sustainable trend? Nicholas Eberstadt doesn’t think so. The other side of the equation is the fertility level, and Russian fertility is very low these days, although it has crept up over the past five or six years. But it is still down 30-40 percent below the replacement level. Is it feasible to think that Russian fertility will rise to replacement level over the next decade or so? Well if Russian fertility does rise up to replacement level, if it does rise by 50 percent from its current levels, this would be because of change in desired fertility on the part of parents in the Russian Federation. So far I don’t think we’ve seen any big signs of a big demand for more children. Rather, what we seem to be observing is that Russia is becoming part of the rest of Europe with respect to ideas about ideal family size. In the rest of Europe, fertility levels are very far below the replacement level. There are a few exceptions like France’s, which are close to replacement levels, but for the most part, European norms on fertility are one or at most two children as the ideal family size. What drives births in modern, relatively affluent societies, more than any other factor, are parental desires about how many children to have. Unless there is a transformation of Russian attitudes about children, its going to be hard for any kind of program of birth incentives or birth schemes to convince Russian parents to have more children then they see as the ideal. 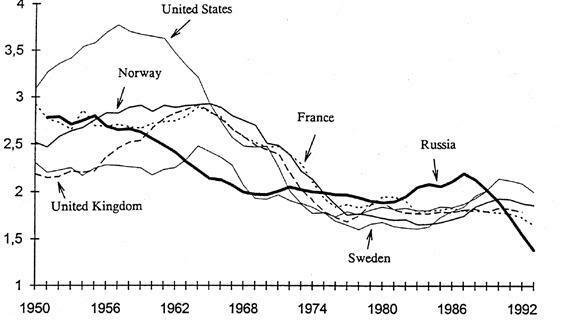 This is an assumption backed up by the raw data – the chart below shows historic fertility rates from an international perspective, in which Russia appears to plummet into and beneath mainstream European levels since the late 1980’s. On the other hand, a 2005 Rosstat study, Family and Fertility, challenges Eberstadt’s assumptions about desired fertility in Russia. The average desired amount of children, within favorable economic and social conditions, was 2.24, 2.40 and 1.99 for women, men and 15-17 year old teenagers respectively in Tver oblast, 2.26, 2.63 and 2.15 in Nizhnij Novgorod and 2.33, 2.56 and 2.11 in Marij El. On the other hand, the amount of children people are prepared to have in the present circumstances is substantially lower. Amongst women, men and teenagers, it is: 1.75, 1.87 and 1.72 in Tver Oblast; 1.60, 1.78 and 1.97 in Nizhnij Novgorod; 1.83, 2.05 and 1.92 in Marij El. According to Rosstat, the birth rate in these regions in 2005 was 9.3, 8.9 and 10.5 / 1000 people respectively, which is similar to the Russian average of 10.2 As such, it’s possible to construct the following table. Italics are estimates based on linear extrapolation from other data in the table. As we can see above, in 2005 there was a gap of 0.65 children between real fertility and planned fertility, and a further 0.5 child gap between planned fertility and desired fertility. A number of points can now be made. Firstly, the post-Soviet fertility drop had much more to do with transitional shock rather than a values shift. That was to be expected; following the collapse of Communism, the state of women’s rights and education (the two biggest determinants of fertility) remained largely unchanged. While religious influence did increase (for instance, the percentage of people believing in the Life Hereafter rose from 21% in 1990 to 37% in 1999 and 45% in 2008), its extent is somewhat exaggerated – it still needs to be borne in mind that proposals to introduce voluntary Orthodox Christianity courses into schools are contentious and that only a very small percentage of people go to church regularly. Russia remains (thankfully) a secular society. Secondly, opinion polls indicate that the era of transition is coming to an end. For the first time during the transition period, the majority of people are confident in tomorrow. The year 2007 was probably the decisive tipping point, and it is reflected in the fact that it was then that fertility rates began the rapid phase of their recovery. Seen in this context, the current demographic doubleback is not surprising, since real fertility rates are simply converging with planned fertility rates. Moreover, as the economic situation improves by 7%+ per year and healthcare expands, planned fertility rates will edge towards desired fertility rates, while the latter are inflated even higher by government propaganda. Thirdly, the current trajectory upwards is not going to last. This year’s January-on-January 12.7% increase and last year’s 8.7 % increase in the number of births is not sustainable and indeed a significant portion of them are due to a one-off increase in the case of previously fence-sitting parents who chose to have another child to get the new benefits package. 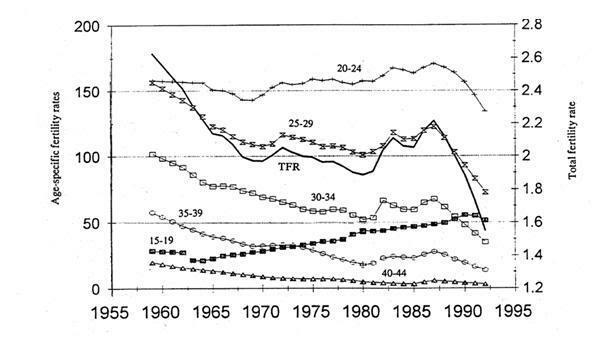 There is a direct precedent for this – from the early 1980’s, state pro-natality policies increased the fertility rate from 1.9 to 2.2, as shown on the graph, but the effect peaked off by 1987. Nonetheless, I think it is reasonable to assume that eventually, say, by around 2015, the birth rate will settle at somewhere in between 1.7 and 2.1, i.e., coinciding with planned fertility. From then on they will probably again resume their decline, following the European (and pre-reform Soviet) pattern. 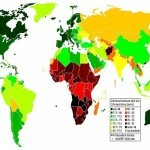 Fourthly, fertility rates are not birth rates. 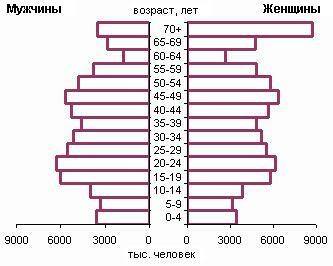 This is especially the case for Russia, whose age pyramid resembles a pine tree, due to the demographic heritage of the Great Patriotic War (1941-45). As you can see, today there is a relatively large number of women of childbearing age. However, the transitional shock, coupled with the echos of war, means that the number of women in the 20-29 age range is going to peak by 2013, and then go into rapid decline. By 2020, it will be surprising if the overall birth rate equals today’s. This means that to avoid an intensified resumption of population decline after that period, Russia will have to massively lower its mortality rates. This aspect is covered in Part II. Alarmist media and certain demented Russophobe bloggers have raised the spectre of Russia becoming a majority Muslim country within the next 50 years. As is usually the case with such sensationalist claims, closer examination clears up the clutter. Below, I worked out the rate of annual increase for Russians and Muslims and linearly projected both to 2025 and 2050 (note that linear projection in demographics is meaningless – in reality, Muslim rates “merely reflect an earlier stage of development and will ultimately fall”). Even in 2002, the vast majority of Muslim people’s fertility rates were below replacement level and falling fast (i.e. there was a big difference in fertility rates between older and younger women). The main reason absolute birth rates remained high was because Muslims, particularly in the South, still have young populations. Even so, their demographic gains in 1989-2002 were not spectacular. According to the 2002 Census, there were 14.5mn Muslims (I see no reason to trust the 23mn figure given by the head of the Council of Muftis of Russia), of whom 13.0mn were from the largest eleven ethnic groups. Using backwards and forwards linear extrapolation (i.e. 1989-2002 growth rates), I estimate the Russian, Muslim and Neither population from 1989 to 2050. The RF population is the sum of the three. In 1989, Russians made up 81.5% of the population of the RSFSR; in 2002, that figure was 79.8%. In the above scenario, it falls to 75.6% in 2025 and 68.7% in 2050 – Russians remain by far the dominant ethnic group. For a Muslim majority we’ll have to wait well into the next century. Of course, demographically linear extrapolation is a pointless exercise, since Muslim fertility rates will continue falling (as is the experience practically everywhere else), while ethnic Russian rates are likely to rise (as shown above). Nonetheless, the very fact that even with just primitive linear extrapolation we can show that Russians will remain dominant in Russia should shut up the likes of Paul Goble, Islamic fundamentalists and La Russophobe. Finally, to demolish one last myth – no, the Chinese are not colonizing Siberia. They come as traders and seasonal workers, make a quick buck, or rather, ruble, and leave. There is little evidence of illegal Chinese settlement in Siberia outside the yellow press. Now for Demographics II – Climbing out of the Death Spiral… (about mortality rates. Third part will be about projections).